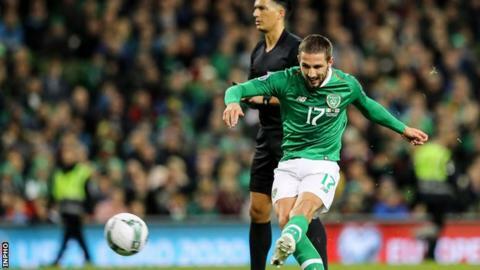 Conor Hourihane's superb first-half free-kick gave the Republic of Ireland a morale-boosting 1-0 win over Georgia in the Euro 2020 qualifier in Dublin. Hourihane's goal came straight after a delay as Irish fans threw tennis balls on to the pitch in protest at John Delaney remaining in the FAI hierarchy. Keeper Darren Randolph denied Valeriane Gvilia before half-time and Jaba Kankava hit the Irish woodwork late on. But Mick McCarthy's men held on to move to the top of Group D.
The Republic lead Switzerland by two points after the Swiss were pegged back to a 3-3 draw by Denmark in Basel having led 3-0. After Saturday's uninspiring 1-0 win in Gibraltar, this was a much-improved Irish display as they started the game on the front foot and withstood some late Georgia pressure. Aston Villa midfielder Hourihane curled in his first international goal after impressive striker David McGoldrick had won a free-kick just outside the Georgian penalty area following a clever turn. As play stopped for Guram Kashia's foul on the Sheffield United striker, for which the Georgian was booked, the anticipated fans' protest against Delaney materialised and it took two minutes before play resumed. However, it was worth waiting for as Hourihane, winning only his eighth cap, curled in a superb strike into the right-hand corner of the net, even if there may have been question marks about the positioning of Georgia keeper Giorgi Loria. The protest came in response to the FAI's decision to create a new role for Delaney, who stood down as the governing body's chief executive on Saturday, only to be immediately moved to a new position of executive vice-president. A short-term loan from Delaney to the FAI has prompted the Irish government to demand further information on the governing body's finances. McCarthy, in his first home game since taking the Republic job for a second time, made two changes - and his decision to leave out the in-form Wolves wing-back Matt Doherty had been a big talking point before the game. However, the manager's call was vindicated as captain Seamus Coleman linked up impressively with the recalled Robbie Brady and Jeff Hendrick down the Republic's right flank early on. Doherty has been probably the Republic's form Premier League player this season but struggled to combine with Coleman in Gibraltar. Aston Villa veteran Glenn Whelan was handed an 86th cap, after his apparent international retirement back in November, and went on to produce a steady display as the holding midfielder. Hourihane's goal was typical of a fine display but probably the biggest plus for the home side was McGoldrick's forward performance as he held the ball impressively and set up a couple of chances for the Irish. After their struggles in Gibraltar, the Republic needed to start with a quick tempo to get the 40,317 crowd on side and they duly did so, Coleman almost providing an early chance for McGoldrick, before Hourihane was denied in the 11th minute by Loria. Brady was pleading for a pass as Hourihane charged towards goal but the Villa man was probably entitled to go it alone as he ran into the penalty area unchallenged before Loria made a fine full-stretch save. After Hourihane's goal, Randolph had to make a superb save to push away Gvilia's point-blank shot in first-half injury time as the Republic crucially remained ahead at the interval. The hosts did have the ball in the Georgian net again on 58 minutes but Hendrick's close-range finish was correctly ruled out for offside. Inevitable late pressure by a Georgia side already assured of a Euro 2020 play-off following their successful Nations League campaign arrived as Kankava rattled an upright in the closing minutes with Randolph for once beaten. But the Irish held on for a success celebrated heartily by McCarthy and his backroom staff at the final whistle. The Republic of Ireland are now unbeaten in each of their 10 matches with Georgia in all competitions (W9 D1). The Republic have recorded four consecutive clean sheets for the first time since a run of eight games in 2011. Hourihane is the first Republic player to score a direct free-kick goal since Robbie Brady against Oman in August 2016. Mick McCarthy has won his first two competitive matches in charge of the Republic of Ireland in both stints as manager. The Republic's next qualifier sees them face Denmark away on 7 June before a home game with Gibraltar three days later.